The ULTIMATE Facial is designed for anyone looking for a more intense version of the CACI- non surgical facial. This treatment concentrates on areas of specific concern, aimed at those with a more mature skin type. CACI Ultimate facials re-educates, tones and tightens the facial muscles by emitting tiny electrical impulses. The use of the Wrinkle Comb and LED light therapy will stimulate the connective tissue, circulation and lymph drainage. Microdermabrasion is the skin resurfacing treatment that is also used in this process. The orbital rotation of the hand piece significantly reduces skin imperfections such as pigmentation, age spots, wrinkles and impurities. Your skin will be left feeling smooth and clear. Light therapy is emitted from the device also to enhance circulation, wound healing, speeds up cell renewal, stimulates collagen and also acts as a calming agent. Microdermabrasion can be used on sensitive skin and normal skin. The disposable abrasion tips come in 3 grades, fine, medium and course. They are coated in an anti-allergy layer of Silicon Carbide that progressively removes the superficial layer of the epidermis. After Microdermabrasion a calming Hydrotone mask is applied to the skin. The mask is used in conjunction with active micro current rollers that massage the face so that the mask becomes ‘charged’. The rejuvenating energy improves lymphatic drainage, giving your face a softer, radiant, youthful appearance. A course is recommended for optimum results, or can be a one off treatment to enjoy. Each client may vary depending on individual requirements. 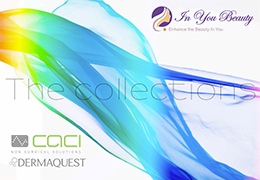 In You Beauty Facebook page…!